David Jason, Tim Healy and James Baxter film Still Open All Hours with a gigantic balloon in Balby. (Photo: Tony Critchley). Comedy legend Sir David Jason has been spotted filming with a huge yellow balloon with a smiley face for the new series of Still Open All Hours in Doncaster. The 78-year-old comedy legend was captured on camera yesterday sporting his trademark brown overcoat and larking about with the inflatable emblazoned with the word "ARKWRIGHT" as cameras rolled. Cast and crew have been at the set in Balby all week to record the cornershop sitcom which will be aired on BBC1 later this year. Today is understood to be the last day of filming at the converted Beautique hairdressing salon on the corner of Lister Avenue and Scarth Avenue - with secret location filming thought to be taking place at various sites across Doncaster next week. 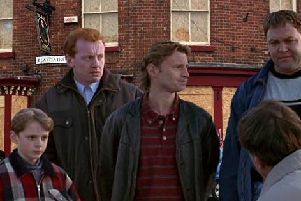 Stood outside of his store, inherited from his uncle Arkwright (Ronnie Barker) the shopkeeper engaged in conversation with fellow characters Gastric (played by Tim Healy) and Granville's son LeRoy, portrayed by James Baxter. The pair were spotted running after the huge prop which was partially stuck in a car, while Granville appeared more concerned in inviting customers into his shop. The revived comedy – which originally ran from 1973 to 1985 as Open All Hours - returned the historic grocer's shop to British screens on Boxing Day 2013 and the original Christmas special was the most-watched show of the day. Since then, the show has become a big hit, with episodes regularly drawing in more than six million viewers per episode and the latest series will mean that it will surpass the number of episodes of Open All Hours.